It wasn't a great month for GE, but the seeds of recovery are being sown by CEO Larry Culp. Shares of General Electric Company (NYSE:GE) had a bizarre October. According to data provided by S&P Global Market Intelligence, the stock closed the month down 10.5% in line with peers United Technologies and Honeywell, and with every other major industrial company for that matter. So it's simply a matter of the market selling off industrials in fear over an upcoming cyclical slowdown in the U.S. and in response to weak economic data coming out of China, right? October was a highly volatile month for GE's stock price. Image source: Getty Images. Well, that's the easy answer, but a quick look at the chart shows that GE stock was actually up by around 20% at one point in October. The move up followed on from Larry Culp's appointment as CEO amid the hope that he would get the company back on track, and at the very least, GE would start giving reliable earnings guidance. 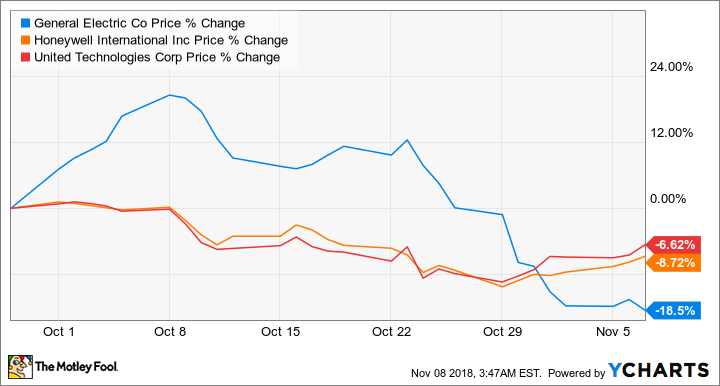 As you can see below, the rally ultimately fizzled out, and subsequent to the GE's horrible third-quarter earnings report (GE gave results on Oct. 30), the stock's absolute and relative decline continued. It's never a good idea to read too much into one month's trading, but I'm going to do it anyway. The so-called Culp rally indicates that the market is supportive of Culp and see the value potential in GE's stock. However, the down move and subsequent post-results performance suggest that investors want to see some hard evidence in the numbers first. The earnings report was little short of shocking in terms of GE Power, and the lack of specific earnings or cash flow guidance will surely have disappointed investors. In addition, even though the cut to GE's dividend was widely anticipated, the act of doing it will have left many income investors ruing the loss of the dividend. Whichever way you look at it, GE's earnings were not received favorably by the market. Looking ahead, investors will be keeping an eye out for any news flow on the Securities and Exchange Commission investigation into its accounting and end-market conditions for its ailing power segment. Meanwhile, along with every other industrial stock, GE will be moved around on sentiment regarding the global economy. That said, the biggest single event coming up in the next few months is likely to be Culp's commentary and guidance for GE in 2019. He's talked of wanting to give guidance with "conviction and confidence" so stockholders have a clearer fix on the performance of the business. That's the first step in a recovering credibility with investors. If he can do that and convince investors that 2018 will mark a trough in earnings and cash flow, then the stock has plenty of upside potential.